On April 4, 2019 we will celebrate Dutch-US ties at the Netherland-America Friendship Gala at the Pieterskerk in Leiden. With prominent fundraising events such as the Peter Stuyvesant Ball in New York, the Ambassadors’ Awards Dinner in Washington, DC, the Dutch American Heritage Day Gala in Los Angeles and the intimate Boston Dinner Club setting the precedent, we are now bringing this black-tie tradition to the Netherlands to raise funds for the educational and cultural exchange programs of the NAF. Founded in 1921, the Netherland-America Foundation (NAF) is the leading bilateral foundation initiating and supporting high-impact exchange between the Netherlands and the United States, including the NAF-Fulbright Fellowships, programs in the arts, business, public policy and historic preservation. NAF activities provide donors and recipients with access to a broad network of educational, cultural and business organizations that exemplify Dutch and American excellence in a number of disciplines. The Netherland-America Friendship Gala supports the NAF’s crucial and vital charitable activities. The evening’s proceeds will support the NAF-Fulbright Fellowship Program and other exchange programs between the Netherlands and the United States in the arts, sciences, education, business and public affairs. View photos of this event by clicking on the arrows below. 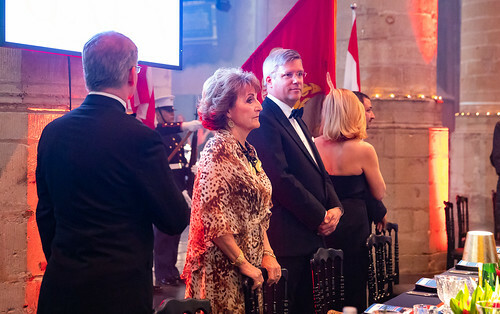 Click here to view the article on the Netherland-America Friendship Gala published March 31, 2019 in Elsevier magazine (article in Dutch). We are grateful for donations received to the Netherland America Friendship Gala Silent Auction, Raffle, and Gift bags. Join the Netherland-America Friendship gala on LinkedIn!